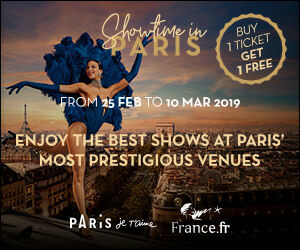 Enjoy a magical evening in Paris: come and discover the magic of Paris by night and the famous Parisian cabaret the Moulin Rouge, a temple of the French cancan! In the first part of the evening, discover the magic of Paris at night and its majestic illuminated monuments. After the tour, you will be taken to the Moulin Rouge to see a performance of the show ‘Féerie’. The Moulin Rouge is without doubt the most well-known cabaret in Paris, in particular for its famous French cancan and its association with the belle époque. Right in the heart of the Pigalle district, you will enjoy a performance of the revue ‘Féerie’: 80 artistes and 1,000 costumes for a grandiose spectacle. A half-bottle of wine will also be served to you during the show. At the end of this magical evening, you will be taken back to the centre of Paris, to the area in which your place of residence is situated. French, English, Spanish, German, Italian, Portuguese, Japanese, Korean, Mandarin Chinese and Russian. - Recorded commentary and personal earphone sets (digital sound). - The services of a multilingual hostess/interpreter. - The Moulin Rouge Show with 1/2 bottle of Champagne per person. - Complimentary individual headsets for each customer for the commentated visit.